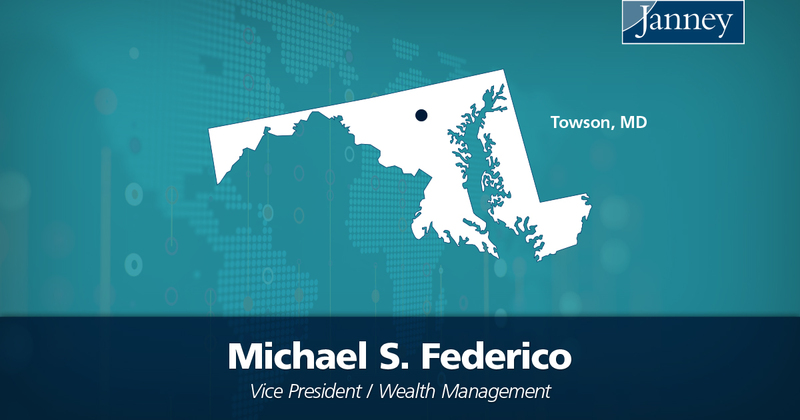 PHILADELPHIA, PA – May 29, 2018 – Janney Montgomery Scott LLC (“Janney”), a leading full-service wealth management, financial services, and investment banking firm headquartered in Philadelphia, PA, is pleased to announce that Michael S. Federico, Vice President/Wealth Management, has joined Janney’s Towson, MD branch office. Mr. Federico joins Janney from Brown Advisory. Michael Federico, a 30-year industry veteran, received his BA from Johns Hopkins University, where he was a student athlete and member of the 1978, 1979, and 1980 NCAA Championship lacrosse teams. He continues to coach and train youth lacrosse players in the Baltimore Metropolitan area today. He serves as a mentor at Crossroads School and is a former member of the Investment Subcommittee at Notre Dame Preparatory School. Janney’s Towson office is located at 409 Washington Ave., Suite 815, Towson, MD 21204.